Many countries in the world are booming which is having positive affect on the global concrete cutting industry. But as the official figures have not been updated for several years the overall market. Jan Hermansson reports. With many construction markets doing quite well around the globe has also affected the concrete cutting industry. The members in the European Union are all showing upturns in the construction sector. Same thing is happening in the US market. Parts of the Middle East, in particular the Gulf region, is booming again, while some countries like Syria, Iran, Iraq and Afghanistan still have a long way to go. Moving further east, India is growing like China did a decade ago. Also in South East Asia the construction business is picking up strongly with an increased use of modern techniques for concrete sawing and drilling. The Chinese construction market has been slowing down for some years, but now appears to be picking up a little. We are still talking about growth in China but at a more modest rate. The number of Chinese concrete cutters is, however, steadily increasing. South Korea and Japan are also growing and in particular the Japanese construction industry with great demand for renewal of the country’s infrastructure. Japan though is facing the problem of an aging population and lacking labour. For the first time in many years Japan is hiring labour from neighbouring countries. Australia has experienced a slight decrease in construction activity, but has come down from a very high level, so business is still good in certain areas of the country. Also on the African continent we have seen a growing use of modern concrete cutting techniques all over the continent, but in particular South Africa. The only continent that still is struggling is South America and very much due to its biggest economy Brazil still having a hard time to get back on track. Brazil is suffering from a political and financial crisis and no one really knows when things will improve. But besides the situation in Brazil, Chile and Columbia’s construction industries have shown a strong increase in the last five years. Also Argentina is showing signs of recovery. With quite positive trends in the market this also affects the demand for machinery and tools. And manufacturers have also this year been developing new products. The big corporate news this year was Husqvarna’s acquisition of HTC and Pullman Ermator with the understanding that both brand names will be retained. The Pullman Ermator premises in Smedjebacken, Sweden and Tampa, US, have been incorporated with Husqvarna’s current premises in the US and the HTC premises in Söderköping, Sweden. Tyrolit held its Cutting Pro Competition in Innsbruck in February and the winner this time was Norway with Austria second and Switzerland third. In March the German concrete cutting show Bebosa took place in Willingen and several new products were launched. Pentruder introduced its modular HFi system. A new player Hidralmac Europe was present and is a subsidiary of the Brazilian manufacturer Hidralmac Brasil, which has in-house production of diamond tools. New exhibitors at Bebosa were also the German diamond tool manufacturer Klingspor. Hilti showed their new wall saw DST-20CA. Dr Schulze showed their new electric floor saw FS800. US manufacturer Merit has launched the new floor saw Merit-AWD-65HP-G and at the same time appointed three new international distributors in 2017. GSSI has launched several new products for ground penetration making life easier for concrete cutters. We have seen a long line of new drilling machines introduced from manufacturers like WEKA, US Saws, Tyrolit and Eibenstock. US manufacturer MK Diamonds launched their new SRX-150 Green Cut Early entry saw. Diacom in the Netherlands has launched a new line of drill segments called the DCCU segment series. German manufacturer Kern Deudiam celebrated 40 years in business this year and the International Association of Concrete Drillers and Sawers (IACDS) held its 2017 convention in Vienna in May. Other new products related to the concrete cutting industry released during 2017 include Hakken Consec, which extended its wire saw series with their new DSM-102A. Pentruder has updated its range with new features aimed at increasing longevity and durability. Husqvarna has launched a new trolley for their large saws. Tyrolit has also launched a new diamond wire named DWL***-CF. Australian manufacturer of power cutters Guarda has launched their new Guarda FTR095 Power Cutter with the Guarda Fume Tube. In the UK manufacturer Diaquip has opened a subsidiary, Diaquip India. US Saws showed a stronger approach this year of selling their equipment globally supported by their launch of the lightweight utility saw FSB-150. In the floor sawing segment quite a number of new machines has been launched. Spanish manufacturer Alba has released their new petrol driven CJP500. German Cedima has launched their new CF2020T with bevel cutting option. Norton has introduced their CS451 ET. Kern-Deudiam has introduced two new electric saws powered by a 7.5kW motor. Merit has launched another M600SS-56HP-D. Ditch Witch, with cooperation with Utilicor, developed a compact crawler with a core drilling attachment. UK manufacturer Dymatec has recently launched a series of diamond blades with SDF technology, which improves water flow and reduces friction. How much is this industry worth? Some years ago IACDS used to provide an annual summary for each member market. But this is no longer available and PDi conducted a survey and some associations responded. In the adjacent chart there are some countries that are not members of IACDS, but still have a substantial concrete cutting industry. These figures are only estimations from information that PDi possesses. The president of the Australian Concrete Sawing and Drilling Association Jason Franken said that besides the 95 concrete cutting members there are 13 supplier members of 33 in total in the country. The annual revenues of concrete cutters vary from small one-man operator companies have an average of about $250,000 (€211,000). Five operator companies around $1.3M (€1.1M), companies with 10 operators almost $3M(€2.5M) and companies with 20 operators around $6.4M (€5.4M). In 2016 the total value of the Australian market was estimated at $555M (€468M). For 2017 the value is estimated to reach $600M(€506M). The CSDAA is not member of IACDS. Also Austria is not a member of IACDS and left the association a couple of years back so the latest figures we have are from 2014. Brazil’s figures are an estimation by people working in the industry. Brazil does not have any national association and it is questionable if the amount of 400 concrete cutters is still valid. The figures for Canada, even though not updated since 2012, are not thought to be lower then stated. The Chinese concrete cutting industry contains at least 1000 firms and probably many more. In the last three years a group of maybe 50 to 100 of the larger firms now have over 100 employees. Figures from the Czech Republic and Denmark from since 2012 confirms the same. Figures from France have not been confirmed since 2011 but it is believed they are not to be lower then stated. The German figures have been recently updated and according to the association the estimated revenue for 2017 will reach $600M (€506M). Germany has also seen an increase in the number of contractors with over 15% since the count in 2015. From India there are no official figures available as there is no association. The figures are based on estimations from concrete cutters and suppliers in the country. But 700 concrete cutters is not an understatement, but most of them are very small companies with one or two employees. The size of the Irish market is unknown as the most recent figures are from 2008. The Italian concrete cutting market has experienced similar experience as the Spanish market, but not quite to the same extent. Due to recession the construction industry has been strongly affected and several concrete cutters have closed down. But still the figure of 200 companies from 2012 is thought to be valid. Aideco is the national association with 13 members. The figures from Japan are updated and the country contains some 1,800 concrete cutters and 84 in the association. The number in the association has declined a little, but still its members provide very strong figures and the market situation is very good. There is quite a large span in turn over between the smallest and the biggest concrete cutting firms in Japan. One of the world’s biggest concrete cutting firms is in Japan. It is believed that the Olympic games, organized in Tokyo in 2020, will have a strong impact on the economy and also the concrete cutting and demolition sectors. Korea is similar to Japan, strong economy, and many concrete cutters, but has no association. The Netherlands is quite a big concrete cutting nation with over 400 concrete cutting firms and 110 in the association, based on the figures from 2012. The New Zealand markets we know very little about and the figures we have are from 2005. Poland did try to organise a national association, but there is no record of the outcome and figures come from 2012. Portugal has no national association, but is believed to have some 30 concrete cutting firms in the country. The situation on the Spanish market is still very difficult. Even though the country is believed to have reached the bottom of the recession and on its way up it has affected the construction industry very hard. The national association used to have over 20 members, now there just four. It is difficult to estimate how many concrete cutting firms there are in the country. It used to be around 120 but today the number is maybe half that. The Swedish concrete cutting industry is doing well, even though the figures have been a little overestimated during recent years. The number of cutters is about 380 and of these some 120 are members of the association BFB. The BFB was inaugurated in February this year when the concrete cutting and the demolition association were merged together. The total revenue for 2016 is some $342M(€288M) and for 2017 it is believed that the figures will increase by 10%. 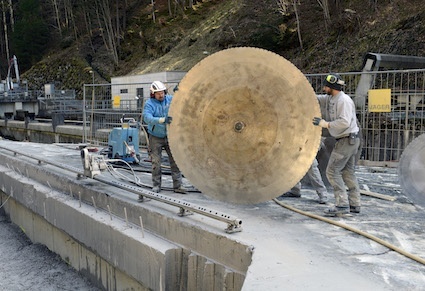 Switzerland is a similar concrete cutting nation to Sweden. Current figures in the chart are from 2014. Thailand is a growing concrete cutting market and it's revenue is not so overwhelming, but it is a potential market for concrete cutting and concrete floor grinding and polishing. Little is known of the Turkish concrete cutting market, but is believed Turkey has some 80 contractors in this sector with figures coming from 2014. The figures from United Kingdom are updated in this report showing a growing sector with quite strong average revenue for the contractors. Figures from the US have not been updated since 2014 but are showing a growing sector again with 360 concrete cutting companies and additional 150 suppliers in the national association CSDA. The average revenue is some $2.7M(€2.3M)/company. We would encourage all that work in this industry to update this chart and provide more accurate figures for future concrete cutting surveys.